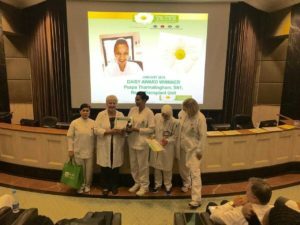 Puspa Tharmalingam, a candidate with Melorita Healthcare, was given the Daisy Award in appreciation for her outstanding effort and care to one of her recipient patients. 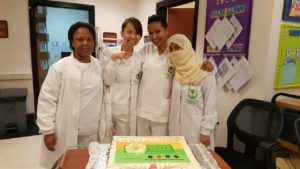 Her achievement was based on her concern to save a patient’s operation from cancellation and with her care and dedication; the operation remained, and was successful. In 2016, the patient was admitted for a kidney transplant surgery but was informed later that the operation was cancelled as the hospital was not able to find his matching blood group. A few days later, the patient was readmitted as the operation was about to be cancelled for the second time, Ms Puspa had stepped forward to voluntarily donate her blood to avoid the surgery cancellation. Upon her quick action, the operation was successful. 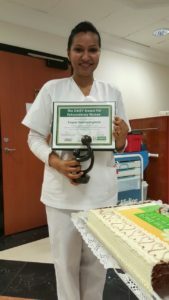 Melorita Healthcare would like to take the opportunity to congratulate our candidate, Ms Puspa Tharmalingam for her Daisy Award achievement and also for being a role model to all nurses out there. Thank you for making us proud. An acronym for Diseases Attacking the Immune System, The DAISY Foundation was formed in November 1999, by the family of J. Patrick Barnes who died at age 33 of complications of Idiopathic Thrombocytopenic Purpura (ITP). 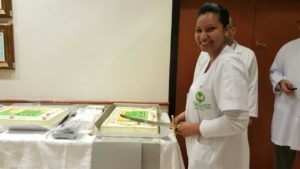 The nursing care Patrick received when hospitalized profoundly touched his family which moved them to create this foundation to honor nurses who go above and beyond the traditional role of nursing to care for their patients.